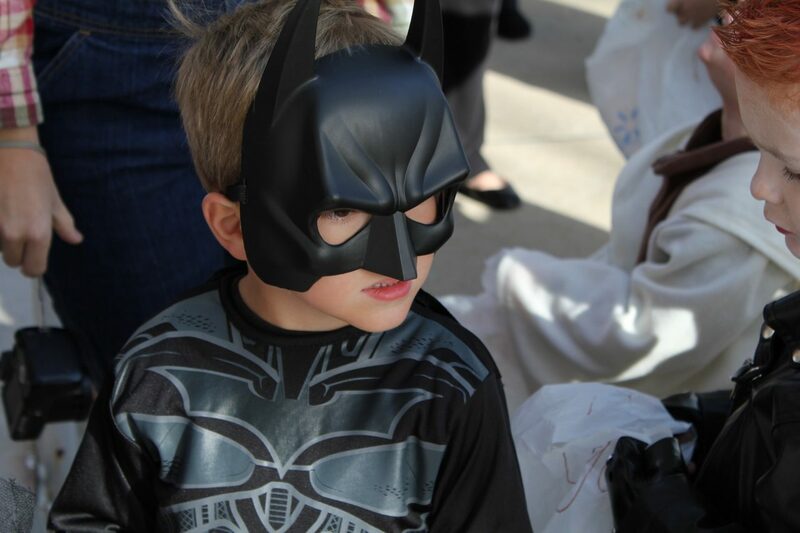 Goblins, ghosts, vampires, princesses, superheroes and more abound on Halloween. It’s a fun holiday, especially for the little ones! Costumes, sweets, pranks, fun, exciting decor and parties fill the season with the best possible combination of activities for children. What could be more fun than donning a costume and eating candy? However, in the midst of the fun, our responsibility as parents is to keep everyone safe. Unfortunately, many of the aspects of Halloween that make it fun, also pose hazards. Costumes, the dark, candles and roaming the streets all combine to create a situation that’s far from contained and secure. How can you balance the risks to make sure that Halloween is both fun and safe? The Weather: In many areas of the country, October 31 can be a cold evening. If this describes your area, make sure that your child’s costume allows you to layer clothing underneath. Visibility: When your child is out walking the sidewalks and streets in the evening, black is not a safe color to wear. Unfortunately, it’s also a popular color for costumes. Add bright, reflective or glow-in-the-dark embellishments to dark costumes so that your child will be easily visible to other pedestrians as well as to drivers. Avoid Masks: Masks can distort or limit your child’s vision, creating a risk for your child. So, if you do choose to use masks, do your best to ensure that your child’s vision isn’t impaired. A better alternative may be to use face paints to achieve the look your child is hoping for. Size: When it comes to capes and draped costumes, make sure your child won’t trip. It’s better to cut the costume a bit shorter than to end up tripping. Taking a flashlight while trick-or-treating does two things to improve safety: it will make it easier for your child to see well and avoid tripping on uneven sidewalks while also making your child more visible to others who are out and about. You can offer your child a small flashlight that can be easily kept in a pocket, making it easy to put away and get out as necessary. Older children may think they’re beyond the age of going out trick-or-treating with mom and dad. If your child is at this stage, make sure that your child does go out in a group with other children. This will provide your child with a certain level of safety and security. Find out who your child will be out with ahead of time and communicate with the other children’s parents if possible to make sure you’re all on the same page. Where: Set out rules about where your child can go or what houses they can visit. Keep in mind that if your child has Picniic on their phone, you can use the GPS feature to keep track of where your child is throughout the evening. Your child can also offer you updates about where they are easily using the app. Who: Find out who will be going out with your child. Treats: It’s best if your child brings their treats home before enjoying any. This will allow you to check them first. For this reason, you may want to send along some approved snacks or treats for your child to have while trick-or-treating and help avoid the temptation of eating uninspected treats. Precautions: Instruct your child not to enter any homes or vehicles that haven’t been approved ahead of time. Remind your child to only knock on doors where a light is on and it’s clear trick-or-treaters are welcome. Also go over basic pedestrian rules such as staying on the sidewalk and looking both ways before crossing the street. Just to be safe, don’t allow your child to eat any treats until you’ve had the chance to look through them. Check for already opened packages or any items your child shouldn’t have. For example, younger children may not be able to have gum, peanuts or hard candy. A this point, you can also take a minute to discuss how much candy your child can eat. Are they free to eat through the treats until their gone? Or will there be a daily limit on the number of candies they can have? If possible, set this expectation before your child even starts knocking on doors. The days leading up to Halloween are prime for jack-o-lantern carving. If this is a tradition make sure you take the proper precautions with your kids. Every year, injuries such as cuts and burns occur thanks to the making of these spooky pumpkins. So, avoid them by encouraging your child to paint or use markers to decorate pumpkins instead. If you do choose to go the traditional route, make sure that an adult supervises all pumpkin cutting activities. The same goes for lighting candles in the jack-o-lanterns. There are also plenty of alternatives to real candles such as battery-operated candles and glow-sticks. If you’re planning on lighting up some fireworks or enjoying a bonfire, make sure you take proper precautions. Keep fireworks and fire-making tools out of the reach of children. Always make sure the fire is completely out and doused with water before heading to bed. If you set off fireworks, be sure to do so in an open area and follow all instructions on the package. By following these tips, you can make sure you and your family have a fun and safe Halloween! So, finish up those costumes, hang the cobwebs, purchase your candy and prepare for this exciting and spooky holiday. Do you have any tips and tricks for staying safe on Halloween? Share them with us in the comments below!